The latest version of the Volkswagen Golf estate, being shown for the first time at this year's Geneva Motor Show, ties in neatly with the model's 20th anniversary. This version, based on the same 'MQB platform' underpinnings as the Golf hatchback (as well as the Audi A3, SEAT Leon and Skoda Octavia), is up to 105kg lighter than the old car. That's helped to reduce CO2 emissions, with the headlining BlueMotion model coming in at 87 g/km CO2 and an official combined fuel consumption figure of 85.6 mpg (equivalent to 87 g/km of CO2). Volkswagen has also increased load space which is up from the 505 litres of its predecessor to 605 litres (loaded up to the back seat backrest). Fold down the seats and you'll find a cargo area of 1,620 litres (compared to the 1,495 litres of the Golf Estate Mk VI). Its styled to closely resemble the latest Golf: right up to the rear pillar it's a standard Golf; it's tailored for the Golf estate from those pillars back. 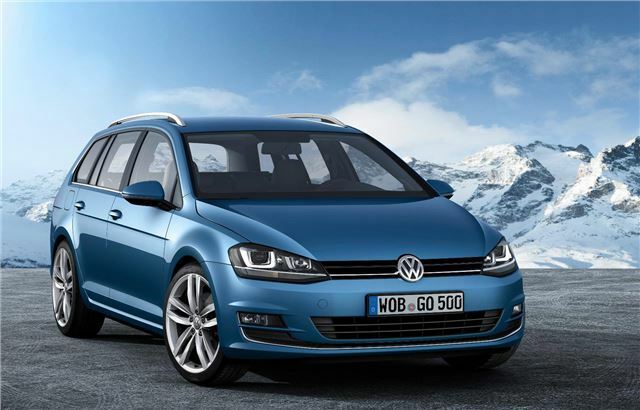 At a length of 4,562 mm, the Golf Estate is 307 mm longer than the hatchback. Visually, the ‘third’ side window forms a part of the D-pillar, with the result that the new Golf Estate appears sportier than its predecessors. That BlueMotion version uses a 1.6-litre diesel engine producing 110 PS, and has a six-speed manual gearbox. Other engines include 1.2-litre TSI 105 PS petrol, rising to a 1.4-litre TSI 122 PS unit to a 1.4-litre TSI ACT 140 PS engine with cylinder deactivation. As well as the BlueMotion model, two other common rail diesel-engined models will be available: a 1.6-litre TDI 105 PS and a 2.0-litre TDI 150 PS. UK sales of the new Golf Estate are likely to start in July, with first deliveries in October. Prices and specification will be confirmed closer to the on-sale date. A shame I need to buy in August and it won't be available then by the looks of it. Will probably think about an Octavia Estate instead.